Would you like Fried Liver with that? Buy your own World Championship title? Short matches = long playoffs? "Football & Chess" is the title of a book I purchased the other day. Written by Adam Wells it looks at the similarities between the games, especially in the area of football tactics. Now at this stage I have only flicked through it, but I kind of have the feeling it is a title in search of a subject. While there is no denying that on the surface football can look like chess, I'm not sure how well it works in practice. This feeling is reinforced by the fact the while the book contains chess diagrams and football diagrams in equal measure, there are no moves attached to the diagrams. So while the author may highlight the importance of 'using space' with a diagram from Smyslov v Botvinnik (1954), how that is converted into a winning position is only described in general terms, rather than with specific moves. Having said all that, I actually didn't buy the book to learn more about chess. What I did by the book for was to learn more about football tactics and structure. I've always seen football (which I played quite a lot as a kid) as a fairly unstructured activity, with not a lot of tactics behind it. However I realise at the higher levels this isn't the case and a book like this provides a good entry point into the world of football strategy. Interestingly the bits I have read tend to focus on the Dutch teams of the 1970's (total football and all that) and I am wondering if this is a deliberate choice, in part because of the importance of chess and football in the Dutch culture at that time. Overall I suspect I will get more out of this book from a football point of view, but that the chess analogies may help me understand more. Congratulations to all the Canberra players who earned titles at the 2011 Oceania Zonal. The titles have now been officially confirmed on the FIDE website. The new title holders are IM Andrew Brown, WIM Emma Guo, FM Gareth Oliver and WFM Megan Setiabudi. Also earning titles from that tournament were FM Moulthun Ly (AUS) and WFM Nicole Tsoi (NZ). All the players are still quite young, with Gareth Oliver the oldest at 23. They also were home grown Canberra players, all coming through the ACT Junior Chess League development program. They join the growing list of titled players in Canberra, although the departure of GM David Smerdon for overseas study has left us short 1 GM. However Andrew Brown and Junta Ikeda are planning a overseas chess adventure for the second half of the year, so more (and improved) titles may be not that far away. I've come down with a cold in the last few days, and so most of the weekend has been spent sniffling and lying in bed (apart from a schools chess competition on Friday, and Street Chess on Saturday). But I did have a friendly game with a friend of my daughters today, and during the game she told me that all the school friends she beats complained of being tired or sick etc. I explained to her that there is a well known chess quote "I've never beaten a healthy opponent", although I avoided using the excuse myself by beating her in our game. In fact the quote is almost entirely connected to chess, as a google search on the quote turns up 22 occurrences, with only 1 non chess result (and even that one refers to the chess quote). I'm a little surprised it isn't used in other sports. Maybe this is because chess players can be real cry babies at times. What do you think? One thought that occurred to me during the draw fest that was the 2011 Candidates matches was a slightly different approach to the problem of early draws. Unlike other sports that use time limits (football, basketball, hockey etc), chess doesn't have a fixed amount of time that has to be played. It has an upper limit, but not a lower limit. So instead of saying no draws before move x, disallowing draw offers before x minutes, is a way of bringing chess more into line with other sports. Under this approach, spectators would at least get a guaranteed amount of action, in the same way that you get 90 minutes of football, or 80 minutes of Rugby. For a game that starts with 90 minutes each (plus increments), no draw offers in the first 2 hours should get most games to the middle game before peace offers would be considered. Of course a player might be tempted to play slowly to get to the 2 hour mark, but they then run the risk of having the draw offer knocked back on the grounds they only have 10 minutes left on the clock. Now I'm not saying this is the only cure for short draws (as other approaches are being refined) but it might be worth throwing it into the mix of ideas. Alexi Shirov had an excellent result in the recently finished Lublin tournament. He scored 5/7 to finish half a point ahead of Grachev and Zhigalko. In the last round he was paired against Grachev and found an inventive way to maintain his half point lead over his opponent. Boris Gelfand has won the 2011 Candidates series, after defeating Alexander Grischuk in the 6th game of the Final. The result was somewhat of a surprise, not because Grischuk was in any way the favourite, but more so because the game had a result other than a draw. This was in fact the first decisive game that Grischuk had played at classical time controls, having drawn the previous 13 games he had played. For Gelfand it was his second win of the series (at the long time controls), the most by any player. Gelfand now gets to play a World Championship match against defending champion Viswanathan Anand next year. I suspect in the next few months the discussion will not be so much about who will win the match but who will pay for it. The hope is that a big Indian sponsor may be found (although this hasn't really happened in the past), although now that the identity of the challenger is known, other countries may be keen to hold the match. You don't get to see many Fegatello's in the wild theses days, as pretty much every opening book condemns it as bad. Looking through my database there are a couple of 2200 rated players willing to play the position as Black but it is almost exclusively played by players rated below 2000. Given that, it takes a brave player to deliberately choose this variation, in the hope that White will sacrifice, and then go wrong. This is in fact what happened at my chess club (ANU Chess Club) this evening. 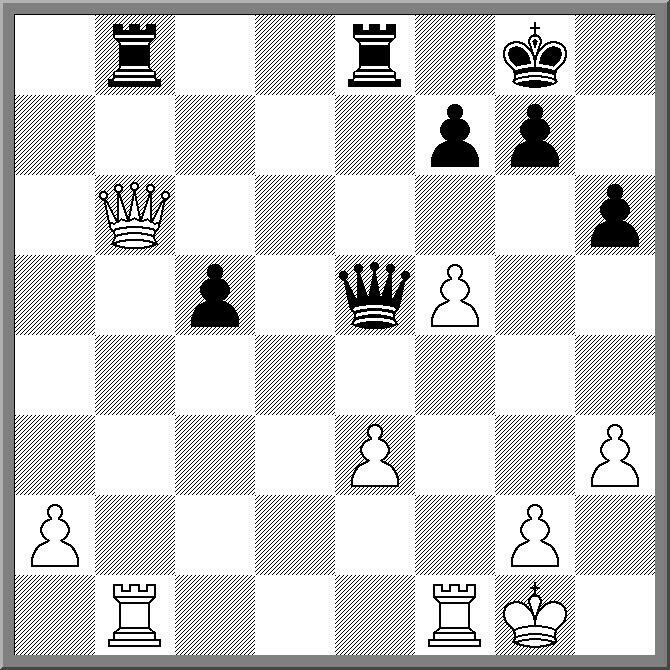 Black allowed the sac on f7, but White was more than equal to the task. 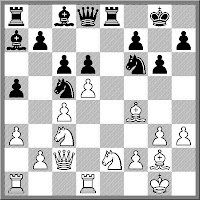 Although both players didn't play the absolute best moves, the exposed nature of the Black king was enough for White to eventually hunt it down. Via a couple of sources is the latest story on robotic chess. Patrick McCabe has built a gantry style robotic system to move chess pieces on a the board. The system uses a 'grabber' to pick up pieces and place them on their new squares (or off the board if they are captured). As designs go, it is pretty straight forward, and looks simpler to implement that an robotic arm. It even uses some fairly cheap hardware, including an Arduino control board, which can be purchased for $40. Congratulations to Alana Chibnall for winning the 2011 ACT Women's and Girls Championship. Alana was the clear favourite, being rated a good 1000 points ahead of second seed Jenny Mason. She went through the tournament undefeated to win her 4th title since 2006. In second place was Kezia Karenina, who only lost to Alana, while Kathleen Tong and Emma Dunstone shared third place. I thought I'd try downloading a chess program for my wife's new mobile phone. Turns out that there aren't that many via the Telstra games sight. In fact I found exactly one, which was part of a bundle of games including Backgammon, Checkers etc But it was only $3, and it wan't going on my phone bill so I thought "Why not?" Now I have quite an interest in 'bad' chess programs, because I can't work out how anyone can write one (or more importantly, why a developer would pay someone to write one). There are enough good programs out there (with source code) that it shouldn't be difficult to program one that isn't completely stupid. And yet such programs exist, and people charge for them. Even though the program in question was on the easiest level, I figured that it might provide a small challenge. It did not. 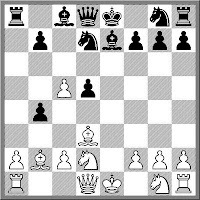 The game began 1.e4 d5 (A opening choice of many weak programs) 2.exd Qxd5 3.Nc3 Qxd2+ So I took the queen and won in another 6 or 7 moves. But as I was playing I discovered something else that raises the level of this program to beyond pathetic. I went to move my light squared bishop to c4 an realised it wasn't a light squared bishop. The board was the wrong way round, in that h1 was a dark square, rather than a light one. The developer couldn't even get this simple task right. They did however place the pieces on the right squares at the start, so the King's started on their own coloured squares. So if you are looking to buy one of the worst chess programs on the market (and you have a Telstra phone), search for 'chess' in the games section. You will be disappointed. The World Chess Federation (not FIDE btw) has been pretty quiet lately, after the supposed multi million dollar match between current (self proclaimed) champion Stan Vaughan and Ron Gross failed to materialise. However I've just received a slightly confusing press release from the organisation which states that (a) bids for a match are now open and (b) there is no minimum amount required to be bid. It seems to imply that this is an open challenge, in that the bid can specify Vaughan's opponent, with the only condition that the winner then play Gross in 2012. However visiting the web page of the WCF (no I'm not giving a link), still speaks of minimum prize pools in the millions, so I'm not quite sure whether a bid of $1 is a valid bid. In a sense I'm hoping $1 would be a successful bid, as it provides an opportunity for someone to take hold of this somewhat dubious title (and organisation) and bury it once and for all. Surely there is some 1800 rated player out there willing to endure a little ridicule in return for doing the rest of us a favour. Anyone? Looks like this weekend will be a busy one for chess in Canberra. Apart from the ACT Women's and Girls Championship at Campbell High and Street Chess in the City, there is also the community day at the newly opened Gungahlin Library. (For those not familiar with Canberra, Gungahlin is the newest Town Centre being developed, so lots of 'new' things are built/opened here on a regular basis). As part of the community there will be chess activities running from 10am to 2:30 pm this Saturday (21st May). It will be a mixture of exhibition, playing, puzzle solving and whatever else comes to mind. It is suitable for chess players of all ages and will be held at the new Gungahlin Library in the Gungahlin Town Centre. "Think with your head, not with your hands" comes in a close second to "Look at all checks and captures" in a list of my most repeated chess sayings. Getting new players to decide upon a move instead of just grabbing the tallest piece on the board is one of the great struggles of a chess coach. However one of the examples I've used in the past did not come from a game between beginners, but from a game between two of Australia's greatest players. In the 1980 Australian Chess Championship the game between Darryl Johansen and Ian Rogers ended dramatically when Johansen played 29.Qb5?? and Rogers replied with the obvious 29. ... Rxb5. 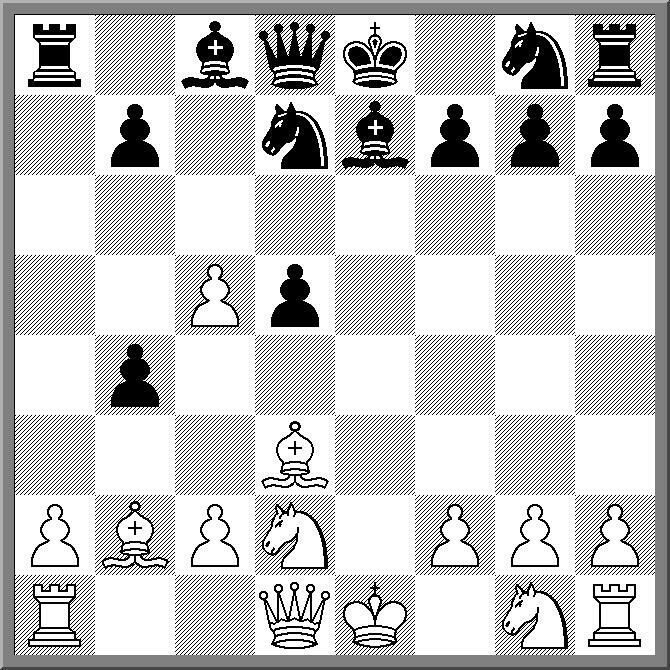 What happened (according to Australian Chess into the Eighties by Ian Rogers) was that Johansen moved his queen to c6 (the best square for it), but did not remove his hand from the piece. He then decided to think about his move a little more and moved it back to the starting square. Or so he thought. 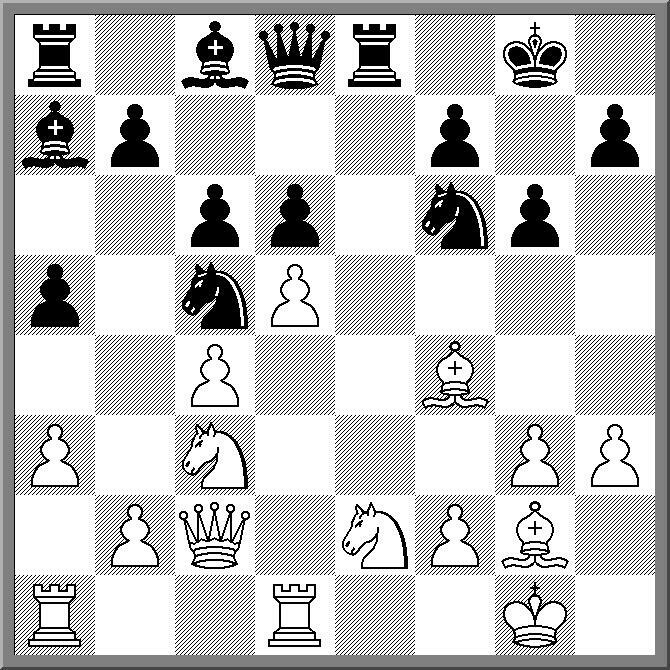 Instead he moved it back to b5 (rather than b6) and removed his hand from the piece, thereby completing his move. And Rogers then took the queen. I'm starting to wonder if FIDE is rethinking the whole Candidates Knock-out format. So far the quarter and semi final matches have seen exactly 2 decisive games out of the 24 games played at the long time controls. Of course some of the drawn games have been quite exciting, but as a method of finding a challenger for the upcoming World Championship match, the shortcomings are becoming obvious. Both sem-final matches (Kramnik v Grischuk, Gelfand v Kamsky) saw all 8 games drawn, and currently they are into the Rapidplay tie-break matches. So far these games have also been drawn and it looks like blitz will once again determine who progress towards the 'Classical' World Championship Match. Now I'm not privy to the decision making process that decided upon this format, but given the fact that all 8 qualifiers were in the same location, and that there are essentially 14 rounds (not counting the tie-break days), an 8 player double round robin would have not taken any more time or effort. It might incur slightly more expense, as all players are involved until the end, but given the number of rest days between the current matches, even this might not be so. The counter argument is that a knockout format is more exciting and decisive, but clearly this isn't the case here. So it will be interesting to see if once again the format for the next World Championship qualifiers changes. Normally I'd say it would be highly unlikely, but I guess these days nothing is certain. Maybe it it will all depend upon what Carlsen wants! Next weekend (21st & 22nd May 2011) the ACT Junior Chess League is holding the 2011 ACT Women's and Girls Championship. Last year saw 22 players take part in the weekend event, and this year the organisers are hoping for a bigger turn out. Although the event is an ACT Championship event, it is open to female players from interstate as well. One of the goals of the event is to provide a good weekend event for female players, which is a laudable aim, given the scarcity of such tournaments in Australia. Over the last couple of year a few players have made the journey to the nations capital, and have always gone away with a positive impression of the tournament. So if you are interested in playing a Women's event, click on this link and send your entry in as soon as possible. If you saw my twitter feed to the right, you would have worked out that my lack of positing yesterday was caused by a failure with the Blogger software I use to maintain this blog. A maintenance upgrade by Google broke something, and it took them a day to fix it. As part of the fix, posts were temporarily rolled back till Wednesday, and even after the more recent posts were restored, it looks as though some user comments have been lost. As the blogger service is provided by Google as a free service, I'm not going to throw a hissy fit about being off the air for 24 hours. Instead, as someone who works in IT for a living, I can just imagine the panic/shouting/running about that went on inside Google as they tried to find and fix the problem. I'm sure the real pain is going to be felt in the next week or two by the poor Google staff who oversaw the upgrade in the first place. However, if it does happen again, I can still update my twitter feed on this blog, so keep an eye on that if posts or comments disappear. A number of years ago (20 or more at a guess), I watched an interesting game at Belconnen Chess Club. It was between one of the club stalwarts and a newcomer to the club. The newcomer was quite a strong player (1800 ish), while the stalwart was a solid 1200 player. As it turned out, neither were aware of the others rating, and after much back and forth the game ended in a hard fought draw. After the game the newcomer was chatting to me and asked about his opponent. "He's pretty good" he said, "he's rated about 1700/1800, isn't he?". "Ah, no" I replied, and informed him of his opponents real rating. And of course a couple of minutes later the stalwart also has a chat to me. "The guy I played, he isn't that good. He'd be about 1200, wouldn't he?" I've always wondered if knowing a players rating has an influence on how we approach the game. For me I would say it is definitely the case, while for others I suspect they would play the same way regardless. The Amaroo School Chess Club has some pretty cool equipment, apart from the usual sets and clocks. It has a 'Smart Board' which is a large computer touch screen system, about the size of a whiteboard. Combined with some useful chess software (in this case ChessMaster Grandmaster edition), it is both an excellent teaching platform, and fun to use. One of the things I use it for is 'Big Screen Chess'. While the kids are playing their Ladder competition games, I will load up famous games and set it on auto-play. It gives the kids something to watch while waiting for the next game, and like most things on a screen, they find it fascinating. I usually go for old games, as they contain a lot of exciting attacks. One example is the following game, played in 1844. 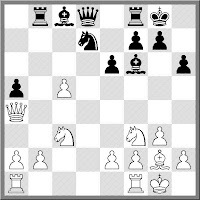 As with most games from that era, checkmating is the main strategy. And also like most games from that era, there appears to be multiple versions of the moves. The version given below comes via Chessbase, although the version in Chessmaster has the king dying on h6, after Black sacrifices another rook! Mileage may vary, depending on your sense of humour. At least for Veselin Topalov. Last year it was the month he lost the World Championship match to Viswanathan Anand, this year it is his exit from the Candidates matches at the hands of Gata Kamsky. But no one could accuse Topalov of not giving his all. Going into the final game needing a win to force the match into playoff games, he gained an edge in the middlegame, and a mistake by Kamsky on move 38 gave him a winning position. 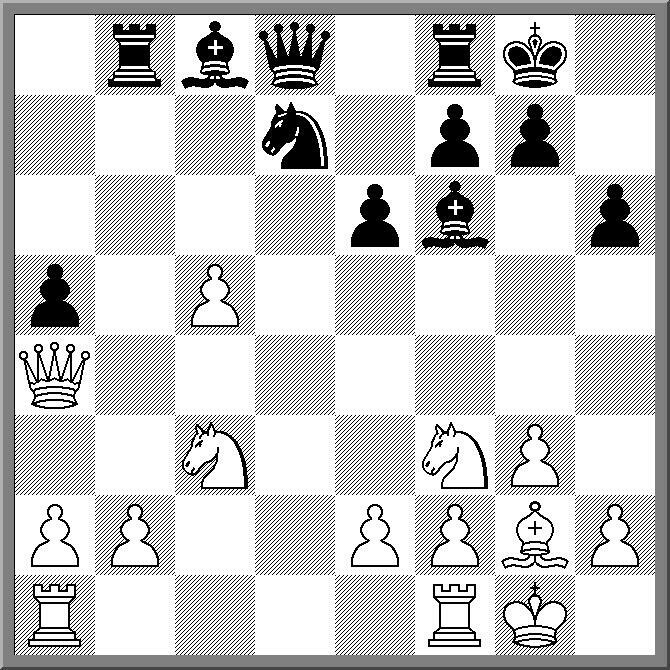 However on move 46 he moved his king into the open, and suddenly Kamsky had enough to draw the game. For the next dozen move Topalov kept pushing for a win, but Kamsky continued to defend, and Topalov abandoned the game as a draw. So the unfancied Kamsky goes through to the next round and a match with Gelfand. The other two semi finalists are yet to be decided, with the playoff games happening as I type this. Due to my habit of posting once a day (meaning I need to squeeze this post in before midnight), I won't be able to cover the finish of the regular games in the FIDE Candidates matches. And of course by the time most people read this post (in the morning), the games will have been decided. However 3 games have been finished (one just seconds ago). In the only decisive match so far, Gelfand goes through to the next round have beaten Mamedyraov 2.5-1.5. Grischuk v Aronian and Radjabov v Kramnik are both headed to playoff matches, with both matches seeing 4 draws. The only game still going is Topalov v Kamsky, with Topalov needing to win the stay alive. While the Radjabov v Kramnik game had some fight in it, the 17 move draw between Aronian and Grischuk makes me wonder if both players decided to save some energy and head for the playoff matches instead. Is this an effect of short matches (2 or 4 games), where if there isn't a decisive lead going into the final game, then a draw is good for players? My reasoning is that rather than risk it all on one game, players prefer to risk it over more games, even if the time limits are faster. Certainly when the players are evenly matched (as we have here) this might make sense. And when the players aren't evenly matched, the stronger player would be favoured over more games (rather than risk a single game upset). So while short game matches may be a necessity due to financial reasons they almost guarantee that the faster games count more than the longer ones. After 2 games of the first round of the FIDE Candidates Matches there has only been one decisive result. This was Gata Kamsky's win over Veselin Topalov, in a game that could hardly be called 'classical'. Looking at the game it was not clear what Topalov was trying to achieve, with his queen out of play, and his king never reaching safety. Kamsky's position wasn't that visually appealing either, but he at least had the excuse he was trying to over run White's position. At the press conference after the game Topalov simply said "I played very badly"
Once again I must apologise to those who play the French Defence for presenting another miniature where it goes down in flames. I'm not sure it is really the fault of the opening, more Black's decision to allow Bxg7 by White when he did not have to (8. ... Bf6 was perfectly fine). After that Black's game goes quickly downhill. The holding of the event in a west Asian country possibly affected the interest from this part of the world, with none of the Oceania countries sending a representative (events held close to home have attracted entries from Australia, PNG, New Zealand etc in the past). Australia was to be represented by Jamie Kenmure (as the only applicant for selection) but he was unable to attend, due to a last minute change of circumstances. After 3 rounds Chinese GM Bu Xiangzhi leads the 50 player field with 3/3. However it is early days yet, with another 16 players within a point of the lead. Results and crosstables for the Open are here, and the Womens event, here. The opening ceremony of the 2011 Candidates Matches is being held today in Kazan, Russia, with the actual matches starting tomorrow. It is an 8 player knock-out, with the first two rounds being 4 game matches (plus play-offs), and the final round being a 6 game match (plus play-offs). The winner of the Candidates Series gets to play Viswanathan Anand in next years World Championship Match, at a venue to be determined. Although knockouts are terribly difficult things to predict, I'll stick my neck out a predict that all the first named players in the pairings will win (although the first and last matched could go the other way). As for the semi-finals, I am less confident of making any pronouncements, but I believe the winner of Kramnik v Aronian (assuming the make it out of the first round), will go on the win the whole thing. The official website is here, and will show the games live. The chess blogs are buzzing with the story about Ukrainian Andrey Slyusarchuk beating Rybka 4 in a blindfold match. Despite the match being televised, the general consensus from within the chess community is it is some sort of trick. The fact that Slyusarchuk does not have a strong chess playing background, and is currently declining any other matches against humans or programs, lends weight to this belief. The main point of discussion is how he did it. Now I'm not saying that this is how they did it, but if I was trying to pull something like this off, it would be how I would do it. Anyway, both Chessbase and Chessvibes are on the case. While the O2C Doeberl Cup and the Sydney International Open were running in Australia, the 2011 Asian Cities Championship was being held in Indonesia. Due to the clash with the 2 big Australian tournaments getting team together from an Australian city was always going to be difficult, but a team representing Sydney did in fact go. The team consisted of IM Gary Lane, FM Tim Reilly, FM Lee Jones and FM Brian Jones. The team was seeded 10th and finished =8th (10th on tiebreak). They won 4 matches, drew 2 and lost 3 for 10 match points, and 18.5 game points. Top scorer was IM Gary Lane who scored 6.5/9 against tough opposition. The tournament winner was the Chinese team from Shi Jiazhuang who won all their matches to finish 3 points ahead of the team from Astana. Full results from this tournament can be found here. Indian FM Akshat Khamparia is the outright winner of the 2011 Sydney International Open after a draw with second seed GM Zong Yuan Zhao was enough the take him to 7/9, a score that no other player reached. In fact draws on board 2 and 3, along with wins on the next few boards left a 7 way tie for second place. While Khamparia went home with a first prize of $4000, the second place getters, (Arutinian, Deviatkin, Goh, Wallis, Solomon, Zhao and Steadman), only earned a little over $900 each. Khamparia also earned an IM norm, although as he has already earned 3 of them, it was superfluous. What he also earned however, was 43 rating points, which lifts his rating above 2400, which he needed to do to confirm his IM title. FM Greg Canfell need to beat FM Steadman in the final round for an IM norm, but Steadman picked up the point. FM Chris Wallis had a performance rating above the 2450 required for an IM norm, but played too many fellow Australians, meaning he missed out as well. The Challengers tournament ended in a three way between Harry Press, Maros Zajac and Tony Davis. Press and Davis drew their final round games, allowing top seed Zajac to catch up with a win over Kashish Christian. Interestingly the final round pairing of Press v Beahan was between two players from the bottom half of the draw, and these players had met Davis and Zajac in the very first round! Full results from these events can be found at www.chess-results.com or the Parramatta Chess Club website.